Friends are important at every age, and the golden years offer more time to connect with new people. However, it is normal for seniors to be slightly confused about how to find new friends, especially when they used to connect with people based on careers or family needs. Seniors can use this time as an opportunity to branch out by exploring ways to make new friends during the golden years. Simply getting out of the house puts seniors in a better position to meet new people. Venturing outdoors creates an atmosphere of openness that lets other people know about the interest in becoming friends. Seniors can ask their caregivers to go for a walk in the park, or they can choose to go for a swim at the local swimming pool. Rhode Island non-medical in-home care experts are available to provide high-quality care to seniors on an as-needed basis. From assistance with mobility and exercise to providing transportation to the doctor’s office and social events, there are a variety of ways professional caregivers can help your aging loved one continue to live independently. Clubs are not just for school-age kids. 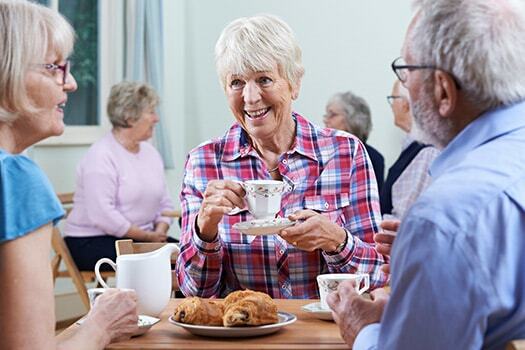 Seniors can find clubs that pertain to their interests in any community, and they can also start their own club if they cannot find one that fits their interests by inviting a group of seniors in the community over for a meeting. From fishing clubs that hit the lake each month to weekly book club meetings, connecting with other people who share similar interests makes it easier to find new friends. Current friends and family members are great resources for connecting with other people. Seniors should let friends and family know they are trying to cultivate new friendships and be willing to let them do a little friendship matchmaking. For example, adult children may know of a neighbor who would love to meet up for lunch, or they may suggest having a caregiver stop by a few times a week. Either way, having someone new to talk to gives seniors something to look forward to each week. If your loved one needs help maintaining healthy habits and accomplishing daily tasks, a Rhode Island caregiver from Home Care Assistance can help. Our caregivers are expertly trained to provide mental and social stimulation, assist with exercise, prepare nutritious meals, and much more. Taking classes is a wonderful way to expand horizons, and learning new things together instantly forms bonds between classmates. With extra time on their hands, seniors can now take the writing class they always wanted to try, or they can learn a foreign language to impress others. As seniors work together with their classmates, they can strengthen their cognitive skills while enjoying the social opportunities that come with returning to school. The internet has expanded social opportunities for seniors who must stay close to home, and they can join online communities and social media sites to stay connected. Seniors can simply set up a profile and begin meeting new friends in the area. From sharing status updates to participating in online video games together, seniors can keep themselves entertained while also meeting new people. If they get out of the house frequently, social media is a great place to find out about new events where potential friends are sure to gather. Regular social stimulation can keep the mind sharp and stave off cognitive conditions like Alzheimer’s disease. In Rhode Island, Alzheimer’s care experts are trained in methods that are designed to slow cognitive decline in the elderly. Using a revolutionary program called the Cognitive Therapeutics Method, Alzheimer’s caregivers keep seniors mentally engaged with exciting activities so they can maintain better cognitive health in the golden years. Call Home Care Assistance today at (401) 284-0979 to learn more about our premier memory care programs.